Depending on the diagnosis, starting and conducting optimum therapeutic measures after a head injury is crucial to ensuring a rapid and safe return to routine training and competitive sports as soon as possible. We will adjust our recommended therapy to your requirements and general conditions. 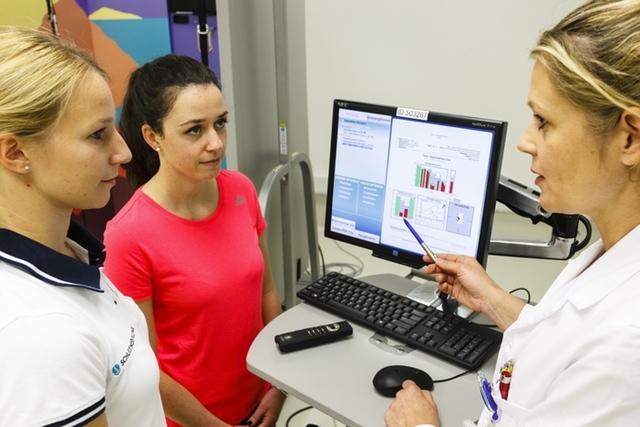 Specific physiotherapeutic measures are recommended based on the diagnosis and the primary symptoms. The training will be tailor made for the individual requirements and problems of the athlete. Depending on the general circumstances and needs, these can be initiated at the Swiss Concussion Center or, following consultation with your medical care team, partially also on the training ground of your team. Vestibular rehabilitation is a specific therapy for disorders of balance or eye movement. It includes an exercise-based programme for the treatment of dizziness (such as rotary or postural vertigo), balance disorders (insecurity when standing or walking), impairments to visual tracking, and for the improvement in coordination of the eyes, head and trunk. 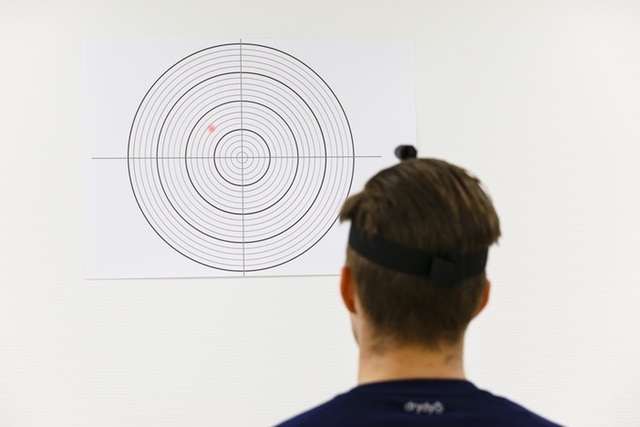 Optokinetic and oculomotor training focuses on problems relating to the stable positioning of images of the visual world on the retina and the perception of space. 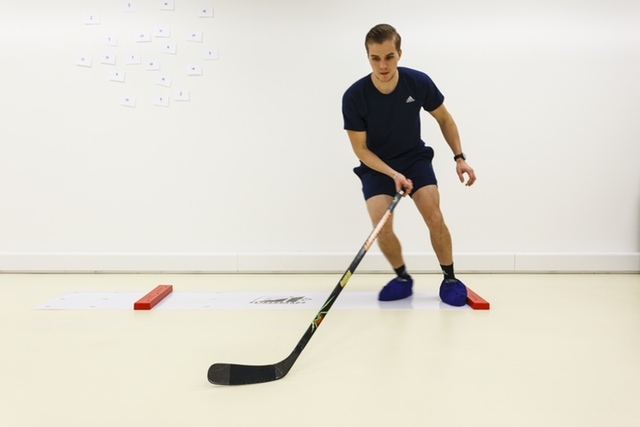 The training programme includes coordination of the eye movements (especially of the vergence and saccadic system and the tracking system) and hand-eye coordination. 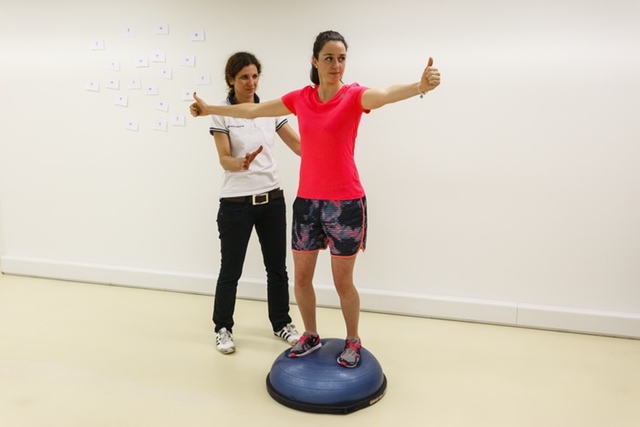 Balance training is aimed at disturbances of postural control, i.e. the central integration of the visual, vestibular and somatosensory systems and the resultant motor strategies. This training serves to improve the specific or complex interaction of all systems. Cervical manual therapy deals with the treatment of functional disorders of the cervical spine and with headaches. The most common cause of this kind of complaint is the direct or indirect trauma of the cervical spine suffered during the head injury. Therapy includes joint mobilization techniques, soft tissue techniques (musculature and fascia) and stabilization/strengthening of the superficial and deep neck and trunk muscles. Sports-specific therapies are particularly essential for a return to routine training and competitive sports, and these should ideally take place under the specific training conditions that pertain to the affected athlete. The sport-specific training focuses on sport-specific problems and demands of the athlete. The aim is a guided and controlled return to sport using a progression of training that is adapted to the individual symptoms and limitations. The return to routine training and competitive sport should be ideally without symptoms, controlled and safe. 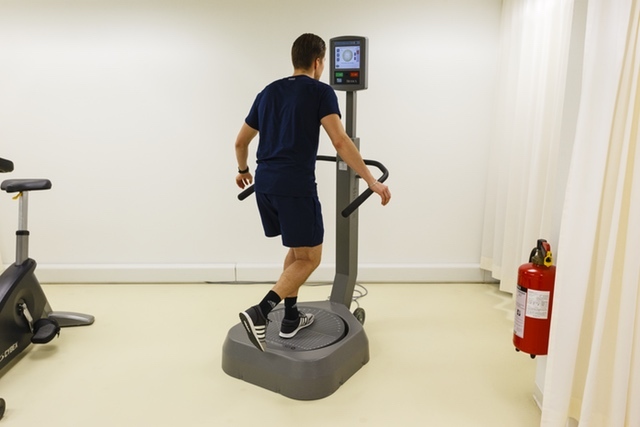 Individual and special therapy can be initiated if impairment to one or more components of the balance system has been objectified by means of dynamic posturography (equitest). Impaired systems can be trained by changing the environmental conditions (such as floor or walls). Positional vertigo is a common cause of post-traumatic dizziness. In the majority of cases, this type of dizziness (usually rotary vertigo) is triggered by changes in the position of the head relative to gravity. Free calcium crystals that are normally bound to a specific site in the inner ear are released into the semi-circular canal by the head trauma where they trigger dizziness, whereby these crystals always sink to the lowest point in the fluid of the inner ear. The crystals can be removed from the semi-circular canals by specific rotary movements, which can usually be achieved during the clinical examination. In complicated cases, these manoeuvres for treating positional vertigo are carried out on a motorized three-dimensional rotating chair. This equipment almost always removes the calcium crystals from the semi-circular canals. Headaches are among the most common and persisting symptoms of concussion and other head injuries and can have a variety of causes. After identification of the cause of the pain, it is essential that optimum therapy is started for rapid pain reduction and to avoid pain chronification. A variety of measures for relaxation are used for easing muscular tension. Jacobson’s progressive relaxation technique is based on the combination of tension and relaxation. Different muscle groups are tensed and then relaxed for short periods, one after the other. Relaxation of the muscles is to be a conscious process, whereby the muscles feel soft, loose and relaxed. After the exercises have been repeated, the relaxation that follows on from the tension is perceived and deepened progressively (more and more, over time). The drug-based pain therapy has two components: prophylaxis (reduction of the frequency and duration of pain attacks) and therapy for attacks (reduction of the pain intensity during an attack). The therapeutic concepts for both components are built up step-wise. If possible, pain medication with a low side-effect profile should be used. Nutritional supplements may also be used as part of prophylaxis. The desensitization treatment exploits the natural capability of our brain to adjust the central integration of sensory signals when external conditions. To counteract a pathologically overactive processing of visual or of vestibular cues for self-motion, the patient is repeatedly exposed (daily for one week) to real and/or illusory self-motion stimuli. The stimuli are tailored to the patient’s need and generate a conflict in the perception (i.e. i feeling a motion but seeing a different one). The daily tuning of the stimuli allows to continuously provide the brain with a small error to be corrected. This strategy leads to a progressive adjustment of the parameters of the integration mechanism and limits the risk of a “rejection” of the re-adaptation process. “Rejection” will instead occur when excessive symptoms are provoked by exposure to uncontrolled self-motion stimuli (as it occurs in real environments like supermarket aisles).